This month, I had the opportunity to test a new lathe from Axminster Power Tool Centre - the AT1628VS trade series lathe. The trade series from Axminster sports a new colour scheme - different from the hobby range - and these lathes are aimed at professional woodturners who use them on a daily basis. In this case, the trade series is stated as being suitable for about 1,000 of hours of use per year, whereas the hobby range is aimed at occasional users where considerably less usage is envisaged. I think this is a case of very clever marketing and provides a helpful guide to show exactly what people are getting. We now have a colour-coding system, which clearly defines the differences between the various types of machines. There is also an industrial range of products - large machinery for big companies, etc. In my opinion, this is a great idea and removes all the 'umming and ahhing' and head scratching when choosing a piece of machinery. Well done, Axminster! Now to look closely at the lathe. The lathe is very sturdy and constructed of machined castings. The headstock and tailstock accept 2MT fittings and the headstock spindle has a 33 x 3.5 thread. The headstock can be moved along the bed and can also swivel with three set positions: 0, 45° and 90°. That said, you can lock it in non-set positions, too. It has a maximum over the bed turning diameter capacity of 406mm and the between centre capacity is 710mm. It comes with standard accessories: a knock out bar, a four-prong drive, a revolving tailstock centre and a 150mm faceplate. It has a 1.5KW (2hp) motor and electronic variable speed - with forward and reverse facility - with two speed range options and the pulleys are a large poly-arrangement. It has a 10° spindle indexing facility at the rear-end of the headstock giving 36 positions and a insertable bar-type spindle lock on the front nose of the spindle casing. The control console is magnetic and can be moved to any position to suit you. The whole package comes in at 96kg. It is modular in as much as you buy the lathe without a stand so you have the option to customise. You can buy a stand as an optional extra and as one would expect now, you can buy an optional bed extension which is 460mm long. The bed extensions can be fitted at either end of the lathe. 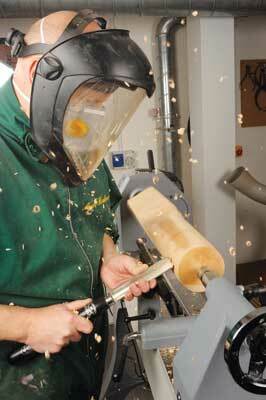 If it is fitted to the headstock end you create a short drop bed extension with a larger turning capacity. If fitted at the tailstock end you have a longer normal bed length. If you buy the optional leg stand, you can fit the bed extension in a lower position still to increase the turning capacity for bowls and platters, etc. to 875mm. When removing a chuck, etc. the spindle lock is functional and the indexing is nice and solid so you can work on projects without it wobbling around. Whilst only the main sections are indicated with a number there are clear lines for alignment with a red line on the headstock, so you know where you are at any one time. The tailstock quill moves freely when you rotate the good-sized handwheel and the whole tailstock and headstock units when slid along the bed locked solid with no sliding, even when under pressure. I liked the swivelling headstock; this helps to maintain a nice standing position when turning bowls, platters and hollow forms and it locks solidly in position. 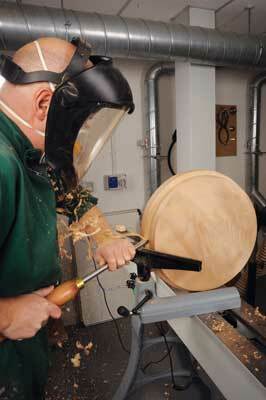 In fact, it is one of the best I've seen this for this type of lathe. The castings are good with no sharp edges and the paintwork seems tough, too. 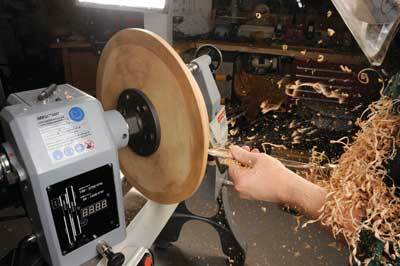 The lathe is quiet and the variable speed is easy and smooth when adjusted. 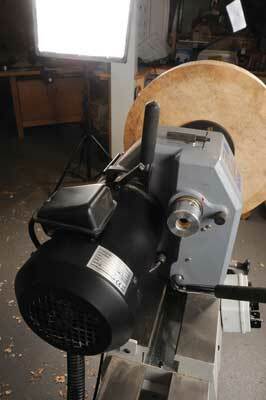 The motor can be easily lifted to change the belts and also locks in place easily after the belt is adjusted. The one aspect I wasn't sure about was the spindle lock which is used when changing chucks, etc. It is a loose pin that you insert in a hole in the front nose of the spindle casting which you can remove when it is no longer needed. It worked well and is totally functional, but just seemed crude in comparison to the rest of the lathe. The lathe was subjected to spindle and bowl turning and I tried to abuse it with various types of cut to see if I could cause it to baulk when faced with a number of different tasks. In fact I couldn't get it to do anything untoward other than a very slight fade in speed when taking a 25mm thick cut on the outside of a large bowl. I tried a couple of bowl blanks and various sizes of spindle work and have to say that it took everything I tried with ease. Not once did I trigger the electronic system of the lathe to cut out. I liked the lathe a lot. Whilst I don't think it will win any awards for styling, it is simple to use, well built, solid and the fact that it is able to work to its capacity with ease makes this a must-look-at lathe. Couple this with the price, I think that it will certainly become a firm favourite with people. 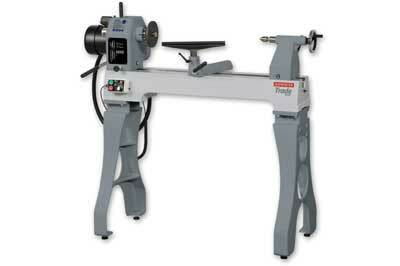 If you buy the lathe with stand and bed extension you are looking at Â£1,695 in total. I think this figure represents excellent value for money when you compare it with similar capacity machines that are also available on the market.